Advanced Dermatology & Pocono Medical Care. Physicians, Milford, PA, Cosmetic procedures. 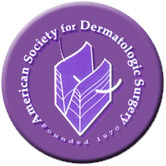 Doctor Buckley, Dermatology, Cosmetic Surgery, Skin Treatments, Laser Treatments. Diagnosis and treatment of skin conditions. Botox, Collagen, Radiance, Fat Transfer.Serving NY, NJ, PA.
Facial augmentation and restoration can be accomplished using a variety of products and procedures, for both corrective and cosmetic reasons. Some procedures require only a single visit to the physician and can be performed in the physician's office while others may require numerous visits, surgical correction and/or several different types of treatment to achieve the desired result. Treatment options for facial augmentation and restoration primarily include injection of an implant material, surgical placement of solid shape implants, skin resurfacing, or surgical correction such as a face lift. The subdermal injection procedure often uses injectable implants intended to provide soft tissue augmentation and restoration. In this procedure, the implant is normally placed with an injection needle. A simple out-patient procedure, it is often performed under local anesthesia in the physician's office. As the product is sterile and implanted directly with use of a needle, the risk of infection or contamination is minimized. There are various techniques used by physicians for placement of the implant material depending upon the type of restoration or augmentation being performed and its desired effect. Results of the soft tissue restoration or augmentation injection are immediately visible. As the implant is injected subderminally into vascularized tissue, there may be a small amount of bleeding associated with the injection. Some swelling, bruising, and/or mild discomfort may occur, but should disappear over a relatively short period of time. Each person's experience and results may differ, so it is important to talk to the physician about what can be expected following treatment. Radiesse is an injectable implant, used for plastic and reconstructive surgery including subdermal soft tissue augmentation and restoration of the facial area. It provides a matrix into which the body's own tissue can grow and maintain the implant in place. Radiesse has proven to be a very versatile facial contouring product and has demonstrated durable augmentation in areas such as chin and cheek where a larger volume is required to bulk the surrounding tissue. Depending upon the intended augmentation, Radiesse can be used to accentuate facial features that require more definition or soften facial features where less definition is desired. • Repair facial defects caused by trauma or a medical condition by providing structure and support for the skin. • Restore bulk to aging tissues. • Correct areas of sizeable soft tissue defects, such as facial deficiencies or tissue loss in the cheek. The components of the Radiesse implant have a long history of safe and effective use for medical applications. Use of only a relatively small amount of implant will provide results that will make a lasting difference. Radiesse has demonstrated durable safe results in many patients, and offers substantial benefits to some of the other available soft-tissue implants. No patient pre-testing is required due to Radiesse’s unique natural product formulation and biocompatibility profile. 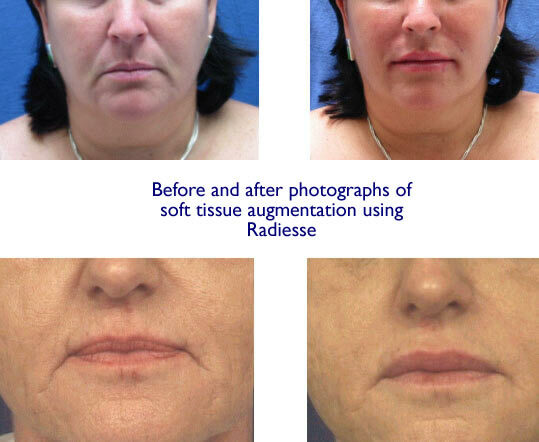 Radiesse will remain soft and pliable and will take on the characteristics of the surrounding tissue, and will offer a durable cosmetic effect to the patient. The microspheres of CaHA have been shown to last up to seven years clinically. Radiesse should provide a long lasting correction, however individual results may vary, affected by age, skin type, lifestyle and muscle activity.